Unlike my grandmother, who had very few playthings, the average American child today gets 70 new toys per year. Multiply that by your child’s age and then add in school papers, art projects, sports gear and uniforms, rock collections, and so on. It comes to a lot of stuff! They and we are overwhelmed by the sheer volume of possessions and stymied about how to gain control. We are stressed, frustrated, and angry. 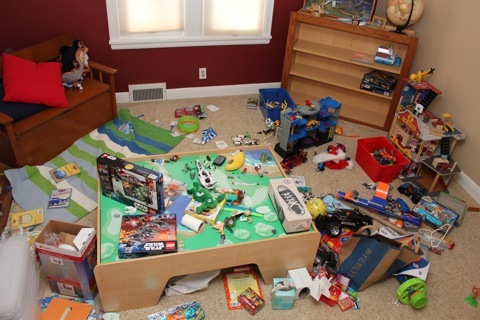 Too often we are yelling at our children to clean up their rooms, get organized, keep better track of their things. Too much time is spent looking for things lost in the clutter. So what can we do? I know that I fantasize that a perfect organizing system will allow me to continue to amass without consequences. This is as mythical as the perfect weight-loss plan that allows you to eat anything and everything without exercising—and still lose weight. Envision for a moment a life where your possessions don’t control you or your time. There are sufficient amounts of desirable toys, clothing, books, hobby supplies, games, sports equipment, electronics, and luxuries available. Family members can find what they want. Time is spent using things, not searching for them or arguing over putting them away. How much stuff would you need in order to have this more enjoyable, manageable life? How much would you need to let go of? What if the default assumption about each possession was that we do not have to have it, rather than that we do? What if we had to justify holding on to something, rather than rationalizing disposing of it? We all know that you cannot take it with you when you die, but which of our things do we actually want to keep lugging around while we’re alive? An effective way to help our children make this shift is to have them proactively select the things they want to keep, rather than picking out what they want to get rid of. Allow plenty of time for this process. Start by physically emptying a child’s room—into the hall and/or another room. Take out all the toys and clothing and moveable objects. Then ask him to put back what he actually wants to have in his room. With younger children, you also can add things in that you know are essential. But be very sparing; they have to be things he’ll need or you will only be recluttering. Organize the room around the chosen things, with shelves and storage areas that he can use and maintain. His room should now reflect his current interests. Gone are the things that just take up floor or shelf space. If he wants 10,000 Legos to play with, fine (well, maybe fine), but the six unused science kits can be disposed of. If he suddenly decides in the future that he loves science kits, at that time you can find or make ones he wants. She doesn’t need every toy or stuffed animal from her baby years—a favorite can be kept in her memory box. So, do have a place (attic, storeroom, closet, shelf) where a limited number of carefully chosen things can be stored for nostalgic purposes or future use as she gets older. If he selects more things than functionally fit in his room, have a closet or box or somewhere where a few overflow things are kept to be cycled into his room, replacing other things that are taken out. The rediscovery and variety make toys more appealing. But if these toys are forgotten and abandoned, then they, too, can be disposed of after a while. And if something matters to you, not him—a favorite storybook or a childhood toy of yours—then you can keep it in your space. During the culling process, do not immediately dispose of what she doesn’t select or she will start holding onto everything to protect her options. Keep the rest of the things in the interim holding area (the hall or spare room) for a week, and then perhaps out of the way in the family storage area for a specified period after that. Then, finally you can toss, recycle, sell, donate, or give away the unwanted and unneeded stuff. This staging process gives her time to figure out what she in fact does want around her. But whenever she brings something into her room, something else has to go out. Think of her room as finite space. Not defined by how much can physically fit in a ten by twelve by eight foot ‘box’, but rather by what can functionally fit in a bedroom, so that everything is accessible and order can realistically be maintained by her. You and she may be surprised at how much of the stuff in her room was there due to inertia or because other people thought she should have it. Be thoughtful about what you bring into the home. Do I want to give this thing house space? If so, for how long? Just because we enjoy something now doesn’t mean that we have to keep it forever. Create expiration dates for things. The contents of a birthday goodie bag could have a one day, week, or month lifespan—and then they have expired and out they go. More valuable items, such as art work from kindergarten, should also have expiration dates. One or two might not expire during your life, but many of them need not be kept past when the next drawing comes home. Others might last for, say, the kindergarten year. You want to be able to enjoy them, not be burdened by them. Consider applying the same selection process to family space—and even to your own things. It is messy and time-consuming, but the pay-offs are enormous. Learn the twenty-first century survival skill of pruning and editing so that you can enjoy the abundance in your life rather than drowning it.